Here I collect all the tutorials that I have made, click on the picture to go to the tutorial. If you re looking for one of my projects post, go to the Projects page. Fortsatt lycka till med din fina sida! My name is name is Neusa, Im from Brazil and I love your work. Could you send me please the parts missing of Lattice Smoking? I need know step 3 complete on page 129. Could you informe to me waht the name of this book and where I localize one? i went through your tutorials. Hi I just wanted to say Thank you for your snocking tutorial!! It’s the best one I have found yet. I am really excited to learn this technique. My name is Katy and I love historical clothing, I’m trying to do some corsets, I have seen your torial, wonderful, always use zip to these and now I try to put grommets but I do not go!! when I hit the grommet is broken by the back. Can you help me?wat I do wrong? hey u r very talented katzzzzzzzzz.i like ur corset very much hope to learn many good thing from u in coming future all the best …….. Wonderful site – glad I stumbled upon it. How do I make a six piece fish tail skirt? Love these tutorials!!! Very simply explained! I sew alot and am venturing into more detailed time consuming designs and this website is wonderful! Love your tutorials! They seem really complete. You really understood what women want: comfort in corsetry. Thank You! P.S. You are being currently featured at a Steam Tea link party going on through this coming Saturday. Hope this will please you as much as your site pleased a member of our group! Thanks so much for sharing your talents. It’s so generous of you. I was thinking of using smocking for the top edge of a linen net curtain that I am making since net curtains can tbe boring and unimaginative. I could only imagine this curtain in my head and could not resolve how to get help with the smocking. I then googled smocking and went straight to your site. The way in which you illustrate smocking is so easy to understand and I also believe your way of helping is in wanting the viewers to believe they can naturally do it well. I did both smocking styles and am ready to use them on a few projects. Yet to venture into the corsets, but I cannot wait. Tack för dina fina arbetsbeskrivningar! Jag vågade mig på att rita mönster och sy en till mig själv 😀en fråga om bröstens form? Jag har rätt stor byst också och när man tittar på samtida bilder ser idealet ut som “äppelbröst”. Runda och höga så jag klippte mina påsar lite rundare, men då blir det lite “luft” kvar på ovansidan av kupan. Kanske det rättar till sig med klänning över? Kirsti: Vad roligt! Det är ju så att det är underklänningen som skapar formen för vad du har över, precis som med moderna bh:ar, så du kan inte räkna med att det kommer att lösa sig bara för att du tar på dig en klänning över. Jag skulle säga att du behöver sy in din bh:klännings kupor lite om du har “luft” kvar. Eventuellt vaddera med något ifall du inte får den formen du vill. my name is Tom Eckert from Germany. Sorry my english is not so good. I will write an article about german Kruseler-figures. For this article I need a Picture. Can I use a Picture from Your Homepage where the starched frilled veil is shown. The veil look verry beautiful. 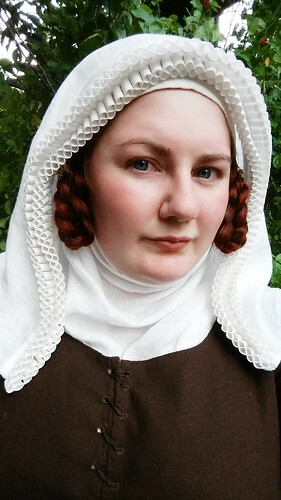 I am looking for assistance in finding a pattern for the small Kampfrau hat that sits on top of the head and along the top of the white head peace. It is small.